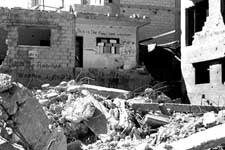 Eyewitness Palestine: :	Only Justice Will Bring Peace | Fight Back! The Internationals for Justice delegation visited Palestine from Aug. 7 to Aug. 21. Fight Back! conducted the following interview with Meredith Aby, Katie Bonn and Anh Pham, three members of the Minnesota-based Anti-War Committee who participated in the delegation. The delegation traveled throughout historic Palestine, particularly the West Bank and the Gaza Strip, as well as the 48 territories, which are also called Israel. FB: The Israeli government has been trying to remove Palestinians from their land for over 50 years. Did you see evidence of land conflicts while you were there? Anh Pham: We saw evidence of that everywhere that we went. There were homes that were demolished and homes that were threatened with demolition. We saw bullet holes through homes that were too close to the border, too close to Israeli settlements or too close to Israeli towns. In Jerusalem, we were with a family with a newly built home who had gotten a notice in the middle of the night that their home was to be demolished. The family had been afraid to leave the house for over two weeks - in fear that the moment they left the house it would be demolished. There is a consistent plan by the Israeli government to demolish homes. This is part of a policy to prevent Palestinian towns from expanding, which is why the Israeli settlements have been build around them. Everywhere that there is a Palestinian village you will see a settlement right outside it. In the West Bank, we saw and were told that the new Israeli settlements were built very strategically in between and around existing villages, to cut off the Palestinian towns from each other. The intent is to prevent Palestinian towns from expanding outward. And Israel also has policies to prevent Palestinian towns from expanding upwards. It's a plan to pen in and to isolate the Palestinian community. FB: The right of return - the right of Palestinians to return to their land - is a major demand of the Palestinians and the solidarity movement in the U.S. Why is this demand so important? Anh Pham: Most of the people that we met, including people in the 48 territories, are refugees in their own country. There are over 4 million Palestinians living outside of Palestine. Palestinians have the right to return to their own country. They should be able to leave their country without the fear that they will not be allowed back in. It is a basic right. While we were there, we heard Israelis say that Israel would never negotiate for the right of return, because that would mean that 'they would negotiate the state of Israel out of existence,' and that if Palestinians were allowed to return, there couldn't be two separate states. I think that when we look at all of historical Palestine, it is frivolous to talk about the 1967 borders. I think we need to talk and look back to when the state of Israel was created and what happened there. If somebody moved into your house and said that you could only have one room and that the occupiers could have everything else, you wouldn't demand just freedom for the one room. You would demand freedom for the whole house. There are people who have a rightful claim to all of historical Palestine. There is no reason why there should not be one, single, secular, democratic state in all of historical Palestine. FB: Since the Israeli massacre in the Jenin refugee camp, where scores of Palestinians died, activists here in the U.S. have been speaking out. What did you see when you were there? Katie Bonn: We started out in Jenin City and were brought into the refugee camp. As soon as we got into the refugee camp, we saw destruction everywhere. There were huge mounds of rubble as high as a house. We went to the area where most of the destruction was. Everybody has heard about it. It was the size of a couple of city blocks. There were no houses left standing. We got to walk around the rest of the camp and we saw that nothing else was left untouched. Not just in the area that everybody has heard about, but everywhere. There were holes in walls and whole walls missing from houses. We also visited the cemetery. A new cemetery was built for the victims of the massacre. There were about 80 people buried there. Meredith Aby: The inspiring thing is that they were able to put up resistance there for 11 days. The various groups all joined together under united leadership and acted as one force. And they still are fighting. Even though Jenin is still under closure and encircled by the military, there are still shootouts every night. People are resisting and refuse to leave, refuse to cooperate, refuse to let their city to be further destroyed. Jenin is a real inspiration to people throughout Palestine. People were talking about how to forge that united front and how to focus on political objectives that everybody could agree on. FB: We've heard a lot about Gaza lately. The Israeli military dropped a 2000-pound bomb on people there on July 22. We've also heard about the strength of the Gaza resistance. What stood out when you were there? Meredith Aby: Throughout Palestine, people referred to Gaza as the world's largest prison. There are a million people in Gaza, and it's one of the most densely populated areas in the world. It has an incredibly militarized border - both the border with Egypt and the border with Israel. In the last couple of months, the Israelis have torn down any house, orange grove or olive grove that was even remotely near the borders. Only about 160 Palestinians are allowed in and out each day through Egypt. We saw, easily, 3000 people standing - waiting to leave. Some people had medical documents saying that they were going to have an operation and they still had to wait. The resistance in Gaza is so strong that the Israeli military is afraid to go in there. The armed resistance in Gaza has been very strong. The people are determined to keep on living and to improve their quality of life. We met with students who were organizing. We met with agricultural workers who were organizing. We met with unionists who were organizing. All sectors of Palestinian society were focused on organizing to improve their situation. FB: The U.S. government says that it is trying to promote peace. Meanwhile, it's sending $13 million a day in military aid to the Israeli government. What role does the U.S. government play in the conflict? Katie Bonn: It's close to $5 billion a year. Israel is the top recipient of foreign aid - economic and military aid. Palestinians know about this U.S. support, and it's not just what they hear on the news. They see the Apache helicopter. They know that it is a U.S.-made helicopter. They see the missile shell and it has writing on it in English. Some of the shells even say, 'made in the U.S.A.' or have the name of the U.S. company. And they know that without the U.S., Israel would not be able to do all these things. We were in Gaza, where they bombed the house of the leader of Hamas and where 20 people died. On the walls, in three different places, it said, "this is the American weapon," in English. They knew where it came from. They knew it couldn't have happened without the U.S. Besides that, they wrote it in English because that is who they wanted it to get back to. They wanted the American people and the world community to know that they know what's going on and that without the U.S. support this wouldn't be happening, or at least not at the scale that it is. I can't think of anyone that we met who didn't know that the U.S. was involved. FB: The Israeli and U.S. governments blame the current situation on the suicide bombers, calling them terrorists. What's your perspective on this? Anh Pham: My opinion on that, and I know the people there agree with me on this, is that talking about the suicide bombers is a diversion from the occupation. The suicide bombers are a result of the occupation. I think that it's a diversion from what we should be talking about. FB: Palestinians and activists around the world, including activists in South Africa, have pointed out the apartheid conditions for Palestinians under Israeli occupation. Did you see evidence of this? Katie Bonn: First of all, there is the segregation. 'Israel is for us and you people live in the West Bank and the Gaza Strip.' Even in the 48 territories, there is an Israeli town and a Palestinian town or a Palestinian neighborhood. For example, in Jerusalem, where it has been annexed, we saw the Palestinian neighborhood s and then we would go to the Israeli neighborhoods afterward to see the difference and it was obvious. Then we found out that only about 10% of the budget is spent on Palestinians, but they pay the same as Israelis in taxes. Even Palestinians who have Israeli citizenship are not equal citizens. You don't need to have a law written to have discrimination. If you go to court, you don't get the same treatment. They have it right on their ID: 'Jew' or 'Arab.' Anywhere you go, whatever you do, it matters if you are Jewish or Palestinian. FB: You were able to meet with a women's group in Palestine. How does the current situation affect the women of Palestine and what is their response? Meredith Aby: We met with two women's groups when we were there. We were told about how hard it was for women economically. A significant number of Palestinian men have been held for questioning or have been held under administrative detention, where they can be held for 3 months without getting a lawyer, without legal rights. A woman can immediately be put in a situation of being the sole breadwinner for her family, in a situation where 60% of the Palestinian population is below the poverty level. The groups were trying to give women job training so that they could provide for their family, but there are not enough job opportunities for people in Palestine. Before the Intifada, 50% of all Palestinians worked in the 48 territories, but the borders have been shut for 2 years, so that has economically everyone affected. This has put a lot of stress on the women there. They also talked about the new opportunities for leadership. They talked about the resistance that was developing, in terms of the roles for women. In both Intifadas, women have played strong roles in leadership. Many women are seeing this as an opportunity to step forward, as an opportunity to fight. 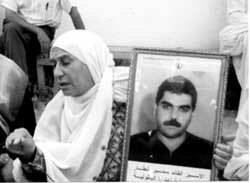 FB: You went to a prison to visit Ahmed Saadat, one of the main leaders of the Palestinian resistance and the head of the Popular Front for the Liberation of Palestine. What happened? Katie Bonn: He was being guarded by Americans, British and Palestinian security personnel. The American and British security interrogated us, trying to be intimidating and playing good cop, bad cop. When they left us, they were right outside the door listening to us. We were in an open shed with windows but no door. It was really, really hot and we sat there for over 3 hours in chairs and waited and every so often these big guards would come and bug us. The Palestinian officers were friendly, but the goal of the American and British security was to find out who we were and to intimidate us. While we were there, somebody got in to see him and we found out that Saadat knew we were there and wanted us to come in, but it wasn't up to him. We were told that in order for us to see Saadat we had to wait for the Americans, the British and the Palestinian Authority to agree to our visit. We were told that Arafat's office wouldn't allow us to enter and so we were turned away. FB: Is there anything else that you'd like to add? Meredith Aby: In the United States, people view the Palestinians either as terrorists or victims, but they are neither. They are not victims - receiving something painful and just accepting it. The Palestinian people are determined. They have a just fight and they have a right to their land.